How Can A Hair Tell You So Much Information? At the recent Christmas retreat in Florida, a brother asked Master why it is that when Westerners come to take pieces of blessed candy or fruit they only take a few, quietly and politely, while the Asian brothers and sisters tend to be more aggressive and competitive, grabbing handfuls at a time. The brother proceeded to ask in a very cute way if there was something that the Westerners had not been told and were missing out on concerning blessed food. Photo 1: Water from a pure source in Japan. This began an earnest discussion in which Master replied that she is too shy to talk about what happens when she blesses the food, but that perhaps people feel it is so special because She only showers the food with goodness - good wishes of health, happiness, enlightenment and compassion. She added that, since She started her preaching activities in Asia, Asian practitioners may have had more time to test and experience the blessed food, so perhaps they appreciate it more. This discussion reminded me of an article I had read a few months earlier on the Internet describing physical evidence that our environment is altered by our thoughts and emotions. Messages come in all forms. Sometimes they jump at us when we randomly flip through the pages of a book, and sometimes they emerge in the words of a complete stranger echoing a question only we knew of. They have also been found in bottles that wash up on the shores of oceans. Even something as basic to life as water has an inherent intelligence through which it can communicate with us. Modern technology can now demonstrate that our thoughts and emotions can change not only our physical being, but even the world around us. Photo 3: The beautiful crystalline structure of water after a prayer. In the scientific world, unless an experiment is repeatable by an independent observer, its findings are considered invalid. So this is exactly what Dr. Masaru Emoto, a visionary researcher from Japan did. Through repeatable experiments he demonstrated that human thoughts and emotions can alter the molecular structure of water. Now, for the first time, there is physical evidence that the power of our thoughts can change the world within and around us. The ripple effects and quantum leap of this discovery are quickly spreading around the world. If you were a skeptic and needed proof, well, now you have it! It all started in 1994 when Dr. Masaru Emoto took samples of water from various sources, froze a few droplets, examined them under a dark field microscope and photographed them. 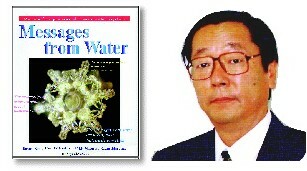 He experimented first with water from a pure source in Japan. The picture revealed a beautiful crystalline form. (Photo 1) He then did the same thing with water from a nearby polluted river. The result was a muddy, smeared pattern with very little structure. (Photo 2) He then asked a priest from a temple to offer a prayer to the polluted water sample and repeated the experiment out of curiosity. To his surprise, another beautiful crystalline structure appeared. (Photo 3) This experiment was repeated many times over with the same result. The researcher then exposed water samples to different types of music. Classical music always reflected beautiful patterns, (photo 4) whereas heavy metal or rock and roll created distorted, formless, smudged images, (photo 5) as if these types of music had destroyed the delicate equilibrium of the molecules. He continued experimenting, this time by writing words on pieces of paper and taping them to a clear glass container to see if anything happened. He tried using positive words like "Love" and "Thank you" (photo 6) and every time noticed a beautiful and delicate crystalline pattern. He tried "You Make Me Sick. I Will Kill You" (photo 7) and each time observed distorted, frightening, muddied patterns. He even experimented with names like "Gandhi" "Mother Teresa" (photo 8) and "Hitler" (photo 9) and the same kind of results occurred. Dr. Emoto soon realized that everything in existence is alive and has a vibrational frequency, a magnetic resonance field, which is the source of energy behind the creation of all things. He was even able to measure this field using a Magnetic Resonance Analyzer (MRA). This research really explains why Sound meditation is so powerful. Not a day goes by when I do not realize that the few commitments we make to ourselves when we practice the Quan Yin Method are the fewest and simplest, yet the most powerful and transforming experiences we can have (and they have no side effects!). Photo 8: The structure produced by "Mother Teresa." Photo 9: The structure produced in water by "Hitler." What makes this discovery so amazing is that we live on a planet covered by more water than landmass, and that the human body is largely composed of water. So if we have the power to change the structure of the medium we are made of by simply producing positive though patterns, we can restore not only our own health but that of everyone around us, and even the planet itself, with our every thought. Photo 10: The crystalline structure of "Love and Gratitude." Think about what giving thanks and praying before a meal can do to your health. I used to believe that it was a good way to stop the mental business of the day and put myself into a more receptive space. Now I know that even the food I am about to eat will also be transformed. If our purpose on earth is truly to bless it, then what better way is there for us to be vigilant and determined in maintaining the quality of our thoughts and emotions than the Quan Yin Method? This understanding truly brings a new meaning to the practice of self-mastery. Now we can no longer pretend ignorance or claim that it is a religious matter. And if sometimes when we feel tired we wonder if we really make a difference, we should think again!